Today, the students of my Introduction to Illustration class and I had the special pleasure of welcoming the prolific and masterly illustrator Katherine Streeter. 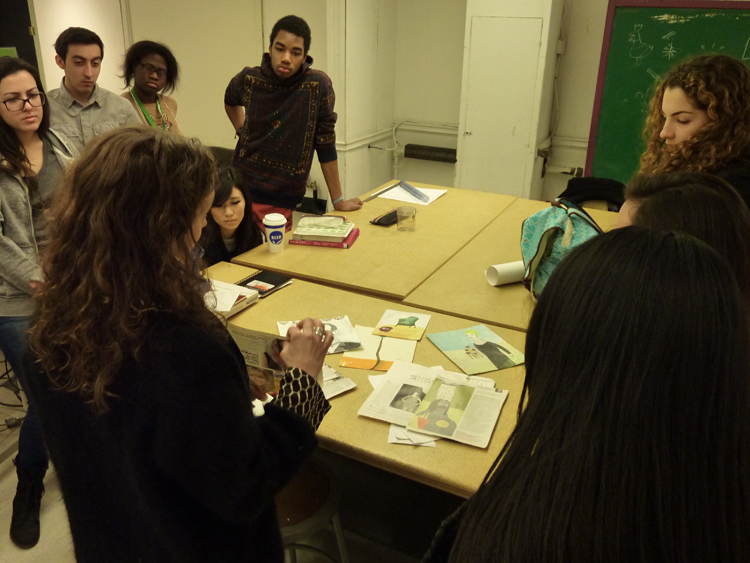 Katherine is traveling from New York to instruct a course about Collaged Images, in an adjoining classroom, and kindly took the time to drop by for a chat and presentation of her inspiring work. What luck to have such a talented neighbor this winter! PS: I just realized that, in a delightful coincidence, Katherine’s visit occurred precisely a year since Victo’s. This entry was posted on Tuesday, January 28th, 2014 and is filed under School visits, Teaching. You can follow any responses to this entry through the RSS 2.0 feed. Responses are currently closed, but you can trackback from your own site.